If this card is added from the Deck to your hand: You can reveal this card; Special Summon it. If this card is added from your GY to your hand by a card effect: You can reveal this card; Special Summon this card, but banish it when it leaves the field. You can only use 1 "Lappis Dragon" effect per turn, and only once that turn. 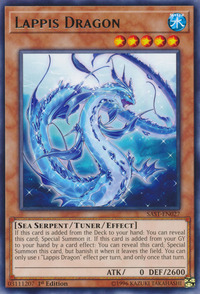 This card's Japanese name is a pun on the phrases Rainbow Treasure Dragon (彩宝龍) and Catch-and-Release (再放流), which are both phonetically pronounced Saihōryū.